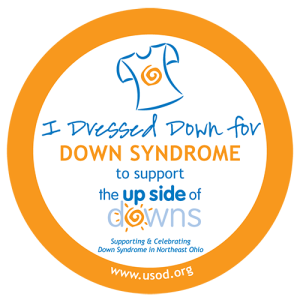 The Up Side of Downs invites your school, company or organization to participate in a Dress Down for Down Syndrome Day. This event raises awareness for Down syndrome within Northeast Ohio schools, businesses and organizations while raising much needed funds to support our programs. To participate in Dress Down for Down Syndrome Day, participants wear casual clothes and are encouraged to donate $5 for this “privilege.” While you can hold your event at anytime, we recommend you consider holding your day during the month of October to recognize National Down Syndrome Awareness Month, or on March 21st which is World Down Syndrome Day −3/21 is representative of having 3 copies, instead of two, of the 21st chromosome. It is a fun, rewarding day that benefits individuals with Down syndrome and their families thoughout Northeast Ohio. 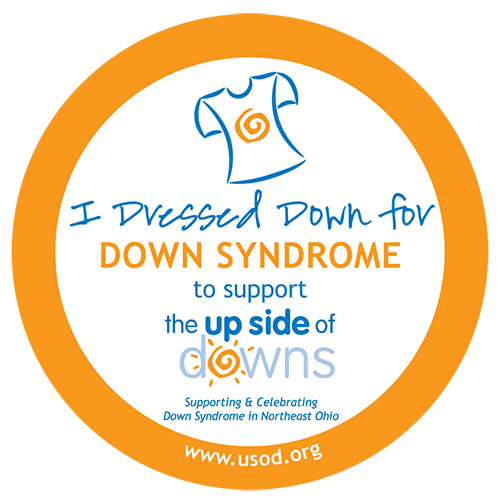 To learn more, print a copy of the Dress Down for Down Syndrome Program Details. Contact the USOD Office Manager to get started today!